The A.43 Black Prince is a Rank IV gift British infantry tank with a battle rating of 6.0. 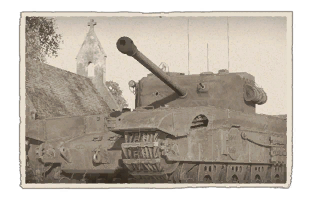 The tank was added in Update 1.53 "Firestorm" and is one of the first British tanks to be introduced into the game. The vehicle is a modified Churchill tank, featuring heavier armour and a heavier primary armament, which gives it superior firepower and protection at the cost of the vehicle's mobility. The A43 Black Prince has the legendary OQF-17 Pounder Cannon; this cannon was made famous by the Sherman Firefly, M10 Achilles and its ability to destroy the German 8.8 cm heavy tanks such as the Tiger tank It also features a single 7.62 mm BESA machine gun, which works great for destroying light tanks and SPAA vehicles. The A43 Black prince makes enemy players retreat in fear, as it offers one of the most powerful guns available in the game, capable of destroying a Ferdinand, IS-2 and other tanks from over 1 km away. The reloading time is great for its rank, at a mere 7.6s and when coupled with the tank's heavy armour, can stand as quite a lethal opponent. However, the Black Prince does have some negatives. The extra armour adds extra weight to the vehicle, which makes it rather slow with a top speed of 10MPH and only -1MPH reverse speed. With the tank's low profile, it makes it difficult to see over foreign obstacles such as debris, hills and walls. The A43 is a rather long tank, and as such, it's not impossible to get wedged between ditches, or get stuck when climbing over an obstacle, as the vehicle lacks sufficient engine power required to pull itself over the obstacles. The only weakness in the Black Prince's excellent armour is along the sides, and its vulnerability to HE rounds, which will often bounce and enter through the roof. The ammunition is located along the sides of the vehicle, making these a primary weakspot for enemy players to target. Suspension wheels and chassis construction are 20 mm thick while tracks are 30 mm thick. Belly armour is 18-25 mm thick. There is a 19 mm thick plate separating the engine compartment to the crew's. A 50 mm turret ring shield is present on the front of the turret. The Black Prince is equipped with some of the most lethal ammunition types in the game. It can carry a combination of different type or just a single type of projectiles. Shot Mk.6 AP - Armour Piercing It is able to to knocking out crew and vital parts such as engines, tract, cannons etc. Shot Mk.8 APCBC - Armour Piercing Capped Ballistic Cap It is able to penetrate and detonated inside of the enemy tank causing maximum damage. Shot SV Mk.1 APDS - Armour Piercing Discarding Sabot This is able to cause maximum damage to enemy tanks. When playing this tank you will, immediately notice the speed and length, it is not a fast tank. You will also notice that it can sometimes struggle to get up hills and small embankments. It is recommended, to stay on flat terrain and to make small sharp turns. This will keep more momentum than a single big turn which will lose most of your much needed momentum. The A43 Black Prince has one of the thickest armour installations of any tanks. The front is able to be continuously hit by larger and more powerful calibre tanks at close range without taking much, if any damage. However, if you come up against a tank shooting HEAT or HE rounds they will likely penetrate the armour with ease. Do not expose the sides to the enemy player, as it is one of the weakest parts of the tank, seconded only to the lower front part of the turret. Not only that, the sides contain the location of the ammunition; If it is hit, it is likely to detonate. If the ammunition does not detonate, the vehicle's crew will be incapacitated. The Black Prince has a slow transverse turret at 10.5 degrees a second. This is one of the most heavily armoured turrets in the game. With the only weakness being the roof. It lacks a top-mounted machine gun, which is normally a deterrent against low flying aircraft, making the vehicle more vulnerable to be attacks by a planes, and an easy target for bombers. The turret's slow traverse speed also makes the use of the internal machine gun useless against aircraft attacks. Due to the low profile of this tank, being hit in the lower front turret is a rare occurrence. You still need to be careful of HEAT and HE rounds, as the low profile design will allow the enemy rounds to enter the turret's machine gun port and either knock out the loader: if using an APCR or solid shot round, OR, if using other rounds such as APCBC, APBC and HEAT, it is very likely that all the turret crew will be eliminated. However, the A43 Black Prince does have one of the most powerful cannons in the game, and is capable of destroying tiger tanks and other heavily armoured vehicles from short to long distances, and is equipped with many different ammunition types which are viable for different situations. The APDS is the recommended choice for giving the gun the full potential of being capable of destroying more heavily armoured targets at longer ranges. When engaged in combat with heavier and more lethal vehicles, using the APDS rounds will allow you to cause major/critical damage. In-order to get the most protection for the tank and crew, do not expose the sides or allow enemies to get to the rear of the vehicle. Instead, turn the front of tank towards the enemy player but give it a slight angle. The enemy rounds will have a higher chance of richocheting off of the frontal plate, however, if the enemy tank uses HE ammunition, there is a high chance that the round may bounce and enter the vehicle's roof. If engaged in close quarters combat, do not allow the other tank to circle and flank you, instead aim for the vehicle's tracks and destroy them and move away, then finish it off. Most importantly, do not allow them to get the rear of the tank, as you will be unable to effectively hit the enemy due to the twin radiators on the back of the vehicle, and the turret's slow traverse. Offensive: Keep your distance from enemy tanks, as the cannon is capable of destroying most tanks from long distances with relative ease. Combined with the slow speed of the vehicle, you'll find yourself being capable of firing on the move despite the lack of a stabiliser. The tank's low profile makes it difficult to see over terrain and obstacles, so it is often best to remain on level ground. Avoid letting the enemy flank you at all costs, as the sides of the Black Prince are the softest weak points, containing the ammunition storage. If the sides of the vehicle are penetrated by enemy rounds, the ammunition will likely detonate, or the crew will be knocked out/critically injured, making you an easy target. It's best to avoid letting enemy players flank you from behind, as the turret's traverse will prevent you from being able to hit them quick enough, and the twin radiators on the back of the vehicle will prevent the turret from rotating all the way. Defensive: When playing the Black Prince, it is often best to find a well-protected and concealed place, I.E. an ally tank, dense woodland or between rubble. Make sure the front of the tank is facing the enemy with a slight angle in order to get the most out of the vehicle's armour, whilst the cannon will allow you to destroy the enemy tanks from long distances. However don’t expose the sides or the rear due to weakness and some vulnerability in the design of the tank. Good reloading speed of 7.6s with stock crew, with further crew skills and qualifications, it becomes one of the fastest in the rank. Max speed 10 Mph (16 Kph). Max reverse speed of -1 Mph (-1.6 Kph). The vehicle's side armour is weak, allowing it to be easily damaged from the sides. The Black Prince is an experimental design that was to use the British Infantry tank, the Churchill, as the basis with much more armour and a better gun. The name originates from Edward of Woodstock, otherwise known as the “Black Prince”, a 14th century military leader. The Churchill and its branch of infantry tanks, in the course of World War II, was becoming slightly obsolete in the highly mobile style of warfare the cruiser tanks proved much better at. The infantry tanks were originally made for heavy, breakthrough style of warfare with infantry, so they were kept around in a style of “heavy tanks”, but the Axis’ gradually increasing anti-tank capacity caused the armour of the infantry tanks to be considered insufficient. To keep the infantry tanks relevant in the course of World War II, the Churchill was upgraded in armour and armament to better compete against the changing anti-tank warfare, starting in 1943. The original Churchill tank in the later part of World War II had the QF 75 mm cannon (British-produced 75 mm from the Americans) and about 102 mm of armour average, and weighed about 38 tons. The Black Prince upgraded the armour to 152 mm thick, widened the tracks by 10 inches, modified the suspensions for the new weight. The 75 mm gun was instead replaced by the QF 17-pounder cannon, which was one of the best Allied anti-tank guns in service. The larger gun required a larger turret and a larger turret ring on the hull. All these modifications increased the tank weight by ten tons, but kept the engine used in the regular Churchill, so the tank was considered under-powered, only able to reach up to 10 mph on roads and this limited the tank’s operational radius. The tank was designated the Tank, Infantry, Black Prince (A43) and the A43 model was for a Staff Specification number issued in 1943 for an interim tank that could be made until the development of a “Universal Tank”. However, by the time the Black Prince was ready in May 1945; it was too late for it to see service in World War II. Even if it had, many more tank designs such as the Sherman Firefly and the Comet are much more mobile and effective, yet have the same 17-pounder gun available. 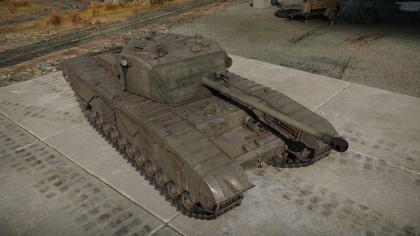 Also, a new tank about to be introduced, the Centurion, has the same protection level as the Black Prince, yet with the same gun and is way more mobile than the Black Prince. This caused the Black Prince to fall into obsolescence and the project, along with the entire line of the infantry tank concept in British tank doctrine, was abandoned in favor of a concept of more mobile tanks with great firepower and protection, which would eventually form the idea of the main battle tanks. This tank can only be obtained; exclusively with the purchase of, one of the following British tank packs. The packs are currently available to buy; from the official war thunder store. For Playstation 4 it can indeed be brought from the official PSN store. This page was last edited on 28 March 2019, at 19:44.